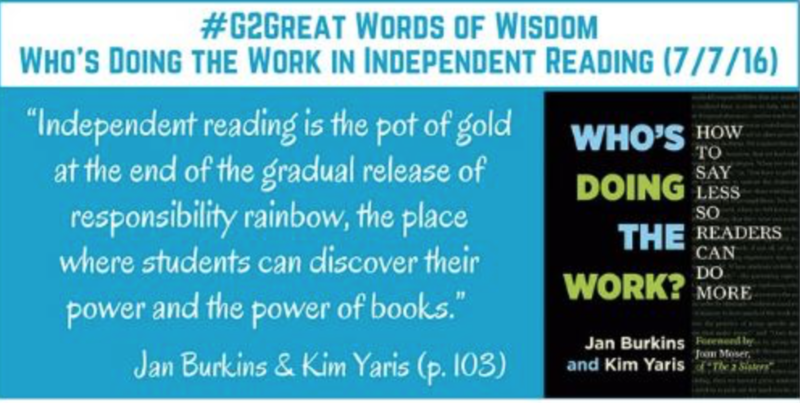 The final #G2Great chat with Jan Burkins and Kim Yaris in a four part series about their book, Who’s Doing the Work? How to Say Less so Readers Can Do More (Stenhouse, 2016) was July 7th. This chat was also the opening prelude to #ILA16 for many conference attendees as well as an all day institute about Who’s Doing the Work. I invite you to peruse the storify here and like or retweet specific comments from the chat. What’s so special about independent reading? Hmmm . . . so a pot of gold? But what’s that power of books? If we begin with the end in mind, then independent reading is where, as this chapter title suggests, our students will learn to love to read and actually find that pot of gold. What are three conditions that will help students learn to love to read? Time in school to read. Independent reading provides students with an opportunity to use and practice everything they know about reading. In sports, it’s similar to the basketball scrimmage where the coach takes notes of drills to work on later. He/she doesn’t interrupt the scrimmage to coach now but carefully collects data to inform his conversations with his players and to consider specific plays to offer during the next timeout. Similarly during class, it’s an opportunity for the reading teacher to take notes on students’ successes and areas for more observation, instruction, or practice. Sam’s tweet says it clearly and Sam, as a student, would know! While reading at home alone is essential, it is not enough. If it’s important, some class time must be allocated so the teacher can observe the readers in action and support them accordingly! Jan and Kim explain in their book that each instructional context is equally important and warrants as much instructional time as the others (p. 143). We know there are huge benefits for our students who read at home, but let’s face it – our student lives are busy. We can control the time in our classrooms. Let’s use it wisely! Let’s provide time “in class” for students to read. There may be naysayers who suggest that “research” doesn’t support independent reading during school time. But the formative data alone that can be gathered from students’ next generation independent reading is well worth its time in terms of cultivating a love of reading and ensuring that students have transferred their reading skills and strategies. A second condition for quality independent reading involves books. What books are present in the classroom? How are they organized? Who makes the decisions about the books that are read in a classroom? Who should make those decisions? How does a teacher determine a “quality book”? What’s the role of a classroom library? Each of these questions could be its own blog post but we do need to explore some major concepts. What books do students want to read? Sam’s views support those who talk about finding books that are mirrors that allow us to see the lives of others or windows into their own lives. . . books where they can connect and see themselves. The field of literacy is discussing #weneeddiversebooks and teachers are much more aware of this even if classroom libraries are not as diverse as they would wish. How do teachers make choices about books? Jan and Kim discuss books in this chapter and tell us that book choice is less about the “just right” books than the specific “levels” that are often considered during instruction. Teacher knowledge is a critical factor as Jan and Kim further explain in this quote. How are books organized in the classroom library? Student input on organization is extremely valuable. Students can help organize and define labels on groups of books by topic or authors. This may mean that book tubs on a shelf in the classroom library will be labeled “Blood and Guts” instead of Level U. Or a tub label might say “If you loved Hatchet, you may love these” so that the labeling resembles GoodReads or Amazon recommendations. Any label that will encourage or tempt a reader beats a label that just lists a level! Choice is an overlapping condition because students need choice in so many aspects of reading including: what they read, where they read, and how they respond to independent reading texts. It’s NOT independent reading if the students are assigned pages or chapters to read as a class assignment. It’s NOT independent reading if students can only read “after work is completed”. It’s NOT independent reading if there is a PACKET to be completed. That need for accountability has to be given up in favor of trusting the students to read and to learn to love to read. Next generation independent reading allows student to choose their own text – not lexiles or leveled text. Next generation independent reading allows students to deeply engage in texts and content of their own choice. Next generation independent reading allows students to correct their own choices if or when they get off track. Isn’t that a characteristic of life-long learners? So we have the three conditions in place. Are we done? How do you, the teacher, sharpen the focus on what students need in order to fully implement the “Next Generation of Independent Reading”? As you’ve read the last three posts and participated in the chats, you have probably realized that you don’t have to make radical changes. In fact, huge shifts from one end of the reading continuum to another make both students and teachers crazy. Balance is always the key! It’s wonderful if the next generation of independent reading looks like your current class reading. But is there some room for growth to ensure that students are doing the work? Are there some minor tweaks that you need to consider to give students more ownership, engagement and empowerment? Reflect on your learning from this chat (or the whole series) and consider the following questions as you plan for next year. Did you begin with the end in mind? Is every instructional context, Read Aloud, Shared Reading, Guided Reading, and Independent Reading, designed to build students’ love of reading? Is every instructional context balanced across a week? Do students see the alignment in the work (and of course the Gradual Release of Instruction) to build independence in reading as well as a joy in reading? Are students learning to love reading? Have your students found that pot of gold? How do you know? For additional resources by Burkins and Yaris about Independent Reading see this digest post. We loved having you as our guest blogger this week Fran, and this is such a great post. Independent reading is a important topic that should be in every literacy discussion. I love that you focused on maintaining the joy that should always be at the heart of independent reading. Yes balance is the key and enthusiastic engaged reading is ALWAYS part of that balance! You all are so welcome, Mary! It was truly and honor and a pleasure to write a guest post about Independent Reading (Chapter 5) of Who’s Doing the Work? How to Say Less so Readers Can Do More by Jan Burkins and Kim Yaris, but it was also a bit daunting. In the Gradual Release Model, Independent Reading has the MOST student work and the LEAST teacher work visible. By this point the teacher is really observing students who are busily reading and checking in occasionally, so there is much less “teacher direction” than for the other three components. The biggest complaint for NOT allowing independent reading is often the lack of time. Debbie Miller’s post here ( https://medium.com/@heinemann/teachers-4-ways-to-find-more-time-in-the-school-day-for-independent-reading-176361d4f200#.pn6v9sy2n ) at Heinemann speaks more to elementary reading blocks but all teachers should consider the four points. Doug Fisher’s #ILA16 quote on Twitter was that 20 min. of reading per day will enable a student to be at the 90th %ile. That’s huge! And just think of all the fun characters, stories and information that the students will have learned while reading! Both the book and the chat are so noteworthy! Thanks for reading and commenting! I love those additions Fran. If we value independent reading (and we should), then we have to make room for it in the day. Love the simplicity and yet power of Debbie’s post and love Doug Fisher’s point! It really boils down to a very simple professional priority: we will FIND the time for what we value! Absolutely! Our actions do tell EXACTLY what we value because we do find the time! You highlight the important issues that were addressed about independent reading both in the chapter and the chat. Choice, time to read in class, and a classroom library that speaks to kids. Thank you for this post! You are welcome, Elisa! The #g2great chats include so many wonderful ideas that focus is sometimes hard!! !